Shipped with: Early Amiga 3000s only. Reworked icons and mouse pointer. 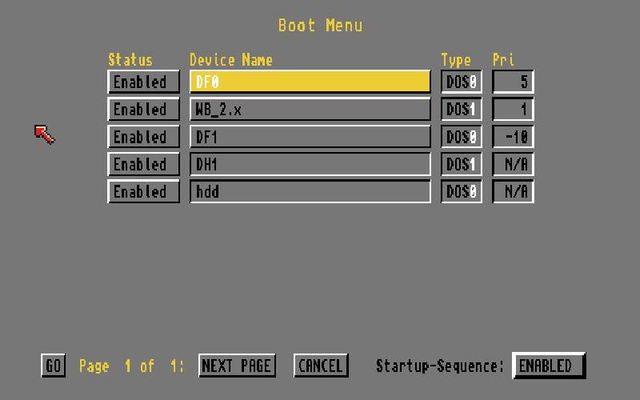 Boot menu added (allowed selection of boot device, and disabling/enabling of devices and the Startup-sequence). 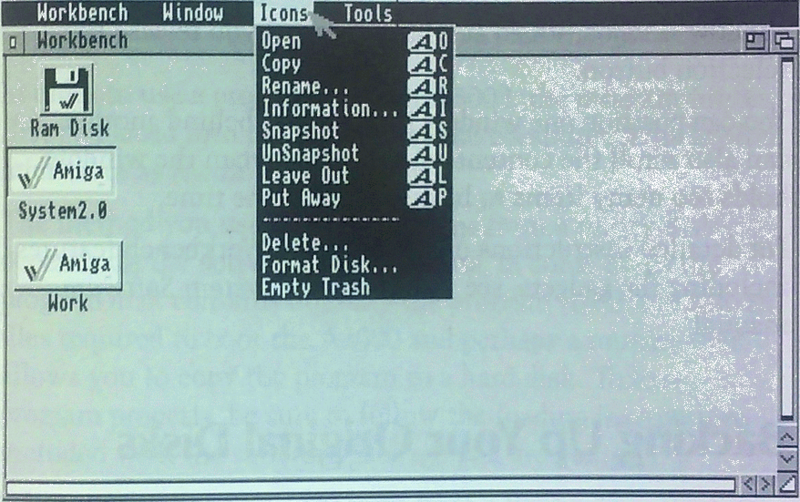 Standard GUI gadgets via GadTools in Kickstart ROM. Preferences individualized; new ones introduced. Standard file and font requesters. Integration of ARexx, the scripting language. New screen modes, up to 1280x512 in PAL (SuperHires mode). Ability to create screens larger than the physical resolution. Better memory management, the FastMemFirst and MergeMem tools were no longer needed. Workbench 2.0 version 36.1, 36.68 was the first official release of the redesigned Workbench (up to this point, a number of beta releases had already been out). 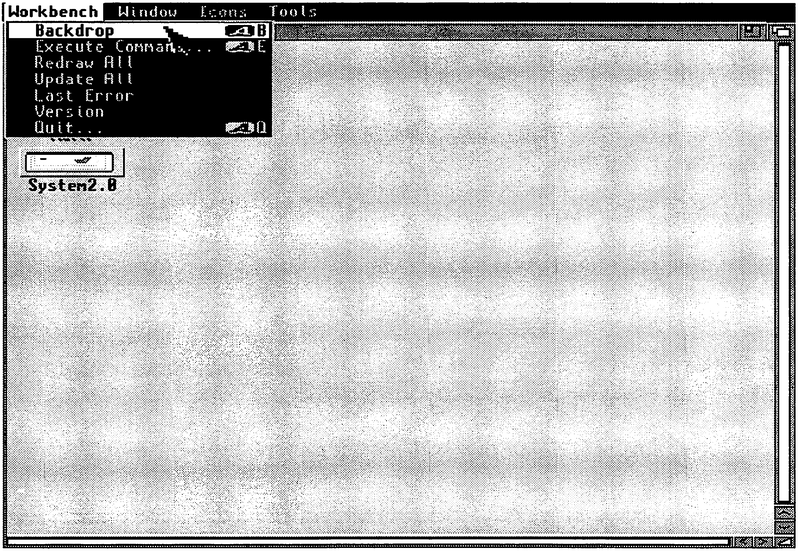 Richard Lane notes that there was a Prefs editor called "WBConfig" (see main screen shot above; was also called "Workbench Preferences", stored in Prefs) supplied with early beta versions of Workbench 2.0 for the A3000. This tool went on to become the "ClickToFront" commodity and the "Workbench window as backdrop" was moved to the Workbench menu. Note that it is in 1.3 GUI style (although font-sensitive). The commodities list has to be manually refreshed when the commodities list updates. He adds: "I also discovered an early version of amigaguide.library, which included a preferences program called "PathEditor" (for editing AmigaGuide/Path env-var). Very early versions of AmigaGuide appear to have been called "HyperText", along with "hyper.library"." Workbench 2.0 required a hardware-based v1.4 ROM chip to get the Amiga 3000 booting before 2.0 could be soft-kicked. Rodney Hester notes that the Amiga 3000 ROM Tower version was actually 1.4 beta 3. Holger Kruse posted on comp.sys.amiga.misc on September 11, 1999: "Commodore never bumped version numbers between beta versions and release versions. 2.0 and 3.0 were both official release versions, not beta versions. However, they were not available for all Amigas (2.0 only for Amiga 3000, 3.0 only for Amiga 1200/Amiga 4000), because the functionality was considered incomplete or transient. Even 2.0 was arguably not a beta version, because at the time Commodore had a policy of distributing beta versions, and even gamma versions, only to registered developers. However, Amiga 3000 owners were made aware of the transient and incomplete nature of 2.0, and advised to use 1.3 for "production work". :-)"